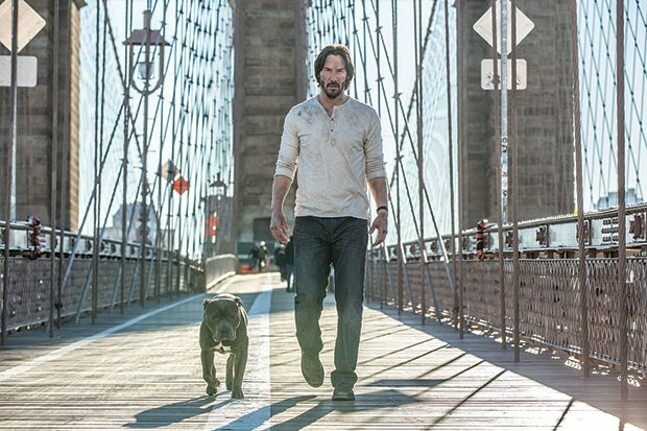 If you caught the first John Wick film, you know what you’re in for with this second installment directed by Chad Stahelski and written by Derek Kolstad. Basically, a lot of people die. Keanu Reeves stars as the titular character, a former hitman who’s looking forward to retirement — for the second time — when an old colleague comes forward to collect a debt. Paying off that debt could mean certain death for Wick, but refusing to pay the debt would be a violation of the code of conduct subscribed to by the network of international hitmen. Such a breach of conduct would also mean death. So Wick sets off to stock up on guns, ammo, knives and a bulletproof suit. The phrase “don’t poke the bear” was created for Wick. On the journey to his peaceful retirement, Wick takes out so many people I felt like there should’ve been a body-count ticker in the corner of the screen. Folks don’t call him the Boogeyman for nothing. Reeves as Wick isn’t much in the dialogue department, but the actor excels here with complex fight choreography that is mesmerizing to watch. But some of the most interesting scenes come when Wick takes a break from his murder spree, and we’re given an inside look at the hitman network. In the midst of the action, Wick and many of his enemies take respite at what might as well be called the Hitman Hotel. Business, a.k.a. killing, isn’t allowed on the premises, adding some much-needed comic relief as Wick shares a drink with fellow assassins played by Common and androgynous newcomer Ruby Rose. For a bunch of cold-blooded killers, this group sure has a lot of rules.